About 8 or 9 years ago I was visiting with a Canadian friend around Christmas time and his mum had made some peppermint popcorn balls just like these. I’d never seen anything like it before and when I tasted them I was blown away. She told me that she’d recently visited home (Calgary) and brought back a big ole bag of Candy Melts for cooking up treats for her grandaughter. Since then I’ve always looked for candy melts but never found them – until last weekend when I saw them totally by chance in Hobby Craft. 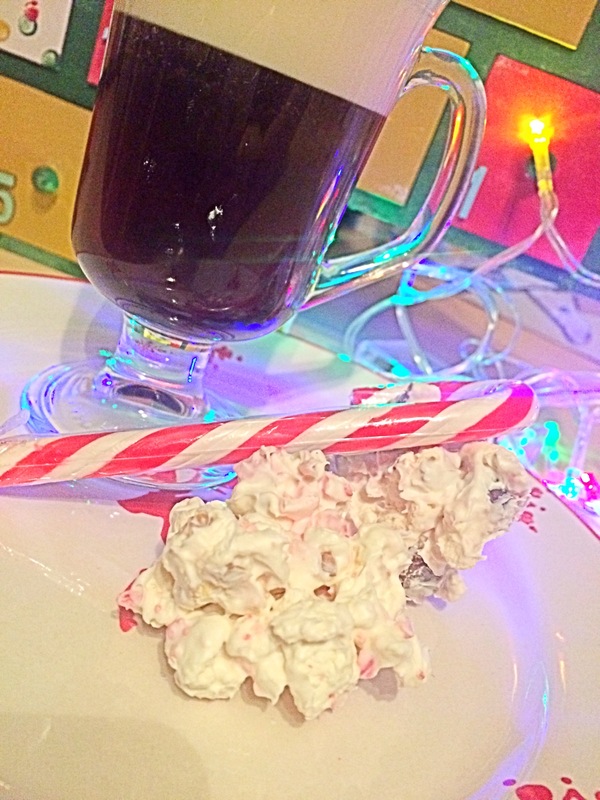 I was catapulted back to those delicious peppermint popcorn balls and duly stocked up on candy melts just so I could share this snackmas recipe with you. It might sound strange but trust me – it’s worth the few pounds worth of investment (and few lbs on the waistline) required and they are great for little nibbles when you’ve got friends round during the festive season. Lets get moving, it only takes about 10 minutes in total. Note: It might feel like a good idea but DO NOT put any food colouring or flavouring in this recipe, it will mess with the candy melts and they’ll go all bitty, like sand. Just don’t. 1. If you’re popping your own corn, pop it now! 2. Throw a couple of candy canes in a bag and crush them up. Take out the week’s woes on that bag – you don’t quite want dust but you do want sprinkles. Think about how the blue meth looks in Breaking Bad. That’s what you’re going for. 3. Melt the Candy Melts using the microwave method – trust me, it’s well easier than melting over hot water and the melts don’t get hot, so you can sculpt right away. 4. When it’s all melted up, stir in the popped corn, choc chips and crushed candy cane and whatever else you’re stirring in there. Treat this like rocky road, throw whatever in. It works. 5. Let them cool a little so you can handle them, then roll/squish into balls about the size of golf balls, or just little clusters. 6. If you’re feeling super fancy, do that confectioners’ drizzle thing with more melted chocolate or candy melts. If not, whatevs, they’re still delicious. You can treat this recipe very much like rocky road – throw in marshmallows, pretzels, nuts, berries. Literally anything. I like the simple tastes of chocolate and peppermint but if I’d bought enough candy melts I’d have experimented more. Will you be giving this simple snack a go for Christmas? Be sure to show me your concoctions! I’m already getting requests for another batchup in ’58!